Noxium’s PRIME Telecommunications Gateway is an industrial cellular communications gateway which includes a PLC interface for communications with SMART-METERS. 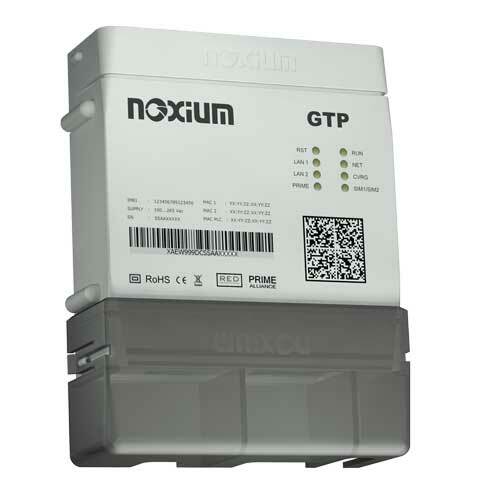 GTP brings together Noxium’s Routex reliability and security with PLC’s communications versatility providing an ideal solution for SMARTGRID networks with last generation intelligent meters. From a Security stand point, GTP enables dynamic tunneling, information encryption and smart routing. GTP also includes a switch wich offers great versatility when configuring different services or applications co-existing in the same infrastructure. Its flexible configuration and WLAN’s offer a wide range of routing options. In Highly available environments, this device operates with redundancy and self-monitoring in an active-active configuration, ensuring low latency delays and enhancing re-activation time. Always in a secure communication environment. In addition, there are GTP versions with Radio redundancy. High MTBF and low maintenance costs are achieved using SNMP, Syslog, debugging and diagnosis tools as well as remote configuration and update features. Compact, ergonomic and easy to instal, use and diagnose. Configurable PLC Communications on Service Node or Base Node with network topology auto-discovery. Compatible with DLMS systems and PRIME PLC communications. It incorporates advance switching functions such as Tagged VLAN and VLAN Discriminated Services. ACL, NAT, PAT and MAC filtering. WAN services Multiplex via auxiliary modem or routers. Redundant VPN Tunnel set-up with active service surveillance. It supports DMVPN (GRE+IPSec+NHRP) up to 4 tunnels (2 tunnels/SIM). Programmed re-boot to enable recovery after failure. Firmware OTA, via FTP, STFP and TFTP. Communications, power and network coverage indicators. Up to two GPRS Clase B, CS1 to CS4 radios (850/900/1800/1900/2100 MHz). Optional Back-up battery for 0,5h full autonomy. Adjusted consumption up to 6W max. Dual SIM, with advanced switching criteria: Signal level, Keep-alive (TCP-3way Handshake and Ping) and network latency. Connected to any mobile carrier using 2,5G, 3G and 4G PAP and CHAP authentication. Dynamic Multipoint IPSec VPNs (DMVPN) with multiple IKE/ISAKMP and advance detection for carrier and tunnel switching. High availability algorithm on DMVPN tunnel switching and Control centre connection redundancy. We are experts on communications solutions, remote monitoring and control.